The 2004 Christmas dinner was held at Carrow's Restaurant, 2819 E. Chapman Ave., in Orange. After dinner a raffle was held with some great prizes; grand prize was a Pryme handheld radio. This was also the first year of the ladies' raffle. Thanks to Kristin - K6PEQ for organizing such a grand party. Our November guest speaker was Mick Stwertnik - KB6JVT of NCG. NCG Company is the North American importer of Comet, Maldol and Diawa amateur radio products. Mick brought examples of duplexers/triplexers, HT antennas, and multi-band mobile antennas to demonstrate the wide variety of antennas and no-holes-to-drill mounting systems they specialize in. Maldol has recently designed a compact HF/VHF/UHF vertical antenna that includes 80/40/20/15/10/6/2/70cm bands. It's only about 8.5 feet tall. Mick brought one to display to the group. Elections for 2005 club officers were also held after Mick's presentation. The annual club auction was held at our regular meeting time and place. Items were limited to radio and electronic equipment only. Registration began at 7:00 PM. Participants are now enjoying their new treasures while others are enjoying the space they regained after getting rid of their junk. The Orange County Amateur Radio Club held its first ever club reunion, inviting past members to join us for food and drink, to talk about and get caught up with old friends and to remember hams who have gone to the final DXpedition. Many messages were received and read from members who could not attend. Thanks to Bob - AF6C for conceiving and planning this event. The ARRL Southwestern Division Convention was held at the Wild Horse Pass Resort near Phoenix, AZ. The convention theme centered around the life of the late famous radio amateur and U.S. Senator Barry Goldwater - K7UGA. At the convention local amateur Jay Thompson - W6JAY received the Hiram Percy Maxim Memorial Award. Dino Darling - K6RIX [now KX6D presented our August Program. Dino, a man not scared of heights, gave us a presentation on the recent changing of the guy wires on the 750' tall tower at KFI in La Mirada. These wires have been up for many years and for safety reasons were replaced. Dino got to ride up the tower and 'help' the crew. Dino's pictures were outstanding as was his recollection of how the task was accomplished. 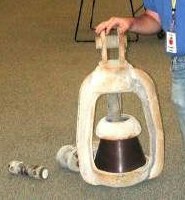 He donated to the club raffle one of the old guy insulators used on the tower (See picture). Sadly, the tower with the new guy wires in place was destroyed on December 19th when a light plane, attempting to land at nearby Fullerton Airport clipped one of the guys. The pilot and his passenger wife were killed. The tower fell to the ground. Kent Gardner - WA7AHY was our speaker at the July meeting. The Society of Amateur Radio Astronomers (SARA), is a wide ranging group that includes about 50% ham radio operators in it's membership. 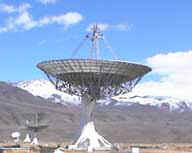 Besides discussing SARA, Kent presented a slide show on a recent conference SARA held at the Owens Valley Radio-telescope near Bishop, CA. FIELD DAY is a yearly held 24-hour simulated emergency communications drill. In 2004 our Field Day was held at Portola Park in Santa Ana. The park is located on East Santa Clara Street between Tustin and Grand Avenues. Several Field Days have been held at this same location. Setup began Saturday morning, with operations running from at 11:00 AM PDT to Sunday at 11:00 AM PDT. Tear-down ended late Sunday afternoon. W6ZE made 1,792 QSOs during the operation. Ken Konechy - W6HHC presented a slide show of past OCARC Field Day events. Shown were many of our success and failures learning experiences. After the slide show that went back briefly for many years, final Field Day preparations were made. Kathy Stanfill - KS6CW and Tom Van Buskirk - K6TV of the Morse Telegraph Club presented a program on American Morse code. This original code is different from the International Morse code that is used by amateurs today. Tom gave an overview and history of telegraph in the United States. Kathy and Tom demonstrated a computer program called The Mill that can teach both forms of Morse code. Kathy and Tom brought lots of antique Morse equipment for us to examine. Approximately 210 running teams from law enforcement agencies nation-wide participated in this year's 120 mile relay race through the California and Nevada Desert. The race began 18 miles north of Baker and proceeded north over Ibex Pass to Shoshone then on to Pahrump Nevada, up the mountains through Mountain Springs and down to Las Vegas, ending at the Rio Resort and Casino. The race is broken up into 20 legs, varying in length from 4.8 to 7.1 miles. As amateurs, we provided course-wide communications using two-meter and 440 MHz radios, packet radio and GPS/APRS displays. Many OCARC members supported the Orange Police team. Arnie Shatz - N6HC introduced the club to the ARRL's new Logbook of the World (LoTW). Arnie is active in the Southern California DX Club. He is a QSL card field checker for ARRL DXCC and CQ awards programs. Arnie explained this free logging service that is valid for most contesting and expedites confirmation of QSOs and eases the expense of mailing QSLs. LoTW can interface with many of the current logbook programs. Travel was booked on a nearly bankrupt African airline. The operators put blind faith in untried vertical antennas. The operating site was surrounded by a major construction project. Power-line surges made casualties of numerous power supplies. The heat and humidity put Finnish saunas to shame. 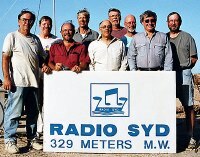 Still the C5Z Team turned in the world high claimed score in the 2003 CQ Worldwide Phone DX Contest. Ken Konechy - W6HHC gave a demonstration of Antenna Modeling software, specifically NEC WIN Plus. Ken showed how to design antennas on the computer before building and raising the actual hardware. Ken Konechy - W6HHC presented a discussion on J-Pole antennas, their construction, how to calculate their dimensions and how they work. J-Poles are VHF ands UHF antennas that are often constructed from rigid copper water pipe. Effective immediately, the meeting time has been moved up to 7:00 PM due to Red Cross security changes. Jan 3rd, Feb 7th, Mar 6th, Apr 3rd, May 1st, Jun 5th, Jul 3rd, Aug 7th and Sep 4th. Nov 6th and Dec 4th.